Perfect for your Prince Charming, this sterling silver frog sculpture has a gold-plated brass crown. 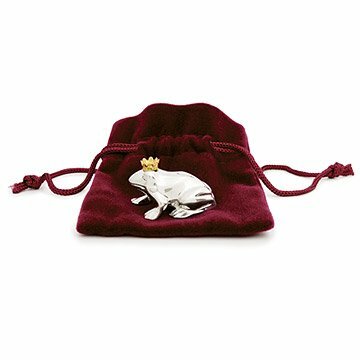 This sterling silver frog wears a crown fit for a prince. Choose carefully: As soon as your Prince Charming sees the box with the words, "you are my prince," written on it, he'll know he's finally won you over. Then, when he opens the box, he will find a beautiful token of love. A red velvet jewelry bag protects the frog, so your prince can carry it with him, if he ever needs to be away. This petite frog prince is about the size of a small strawberry. Made in Vermont. frog: 1" L x .75" H bag: 3" L x 2.5" W; weight: 1 oz. Love the frog just wish it was bigger. But I know he'll love it. This was a Valentine's Day gift to my husband 11 years ago. (yes they still sell it)..As it states it comes in a small velvet bag. My husband has kept it in his pants pocket every day. There was a period of time my husband and I were not together and I had it in my possession. For several years we have been working on our relationship and are getting back together..I gave this token of my love back to him and all it needed was a little polishing(and the velvet bag has wear from being in his pants pocket,absolutely expected)...He now keeps it back in his pants pocket everyday as before..Not only is it a unique gift and token of my love but it has stood the test of time..11 years and it was one of the best, if not the best gifts I ever gave him!..Thank you Uncommon Goods! This little sterling Frog Prince is very charming and makes a sweet little gift. The Frog is packaged in a classy little gift box with a nice inscription on it, but the entire presentation is completely ruined by a heinously tacky huge white barcode inventory sticker put on the gift box by Uncommon Goods. The sticker cannot be removed without ruining the gift box, but it is such an eyesore that it's almost worth it to ruin the gift box. I sent a comment to Uncommon Goods, suggesting that they put the gift box in a bag and put their horrible sticker on that bag, but the response was that it couldn't be done. So, while I recommend the Frog and the original packaging, I think you'll be disappointed unless you get your own gift box, which sadly won't have the sweet accompanying inscription. Although it was small, after reading other comments and reviews, I was not upset. It is very nice quality. This really is a charming little prince! Nice little way to tell my husband on our 20th anniversary that he is still my prince charming. He loved it! I loved my little prince it was a great idea for a valentines day gift that was easy to have mailed and personalized. It is a little small but I realize it is because of the price ( which wasnt so bad) it is so small for the quality. Other than that I though he was a cute little keepsake! The gift was perfect for the person I bought it for, but for the price one pays the items size should have been bigger. When I first opened the bag the crown was missing. I found it in the bag and had to use super glue to get it to stay on. Don't think my wife was impressed! The frog prince is much smaller than thought. It is a good quality silver with a good weight to it. I got it in a gift box so I did not inspect it before giving it. Once opened, I wish that it had come with a polishing cloth. It was clearly visible that it needed to be polished. This frog will be set in a desktop Zen Garden for an office. A little larger would make it stand out more.